TeamMojang Released a video showing off one of the new Minecraft XBOX Avatar Props. Sheep Shears! What else would you like to see as an Avatar Item? 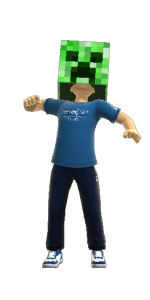 Minecraft Pig head & Cow Head XBOX Avatar Code Giveaway! No Texting Needed! 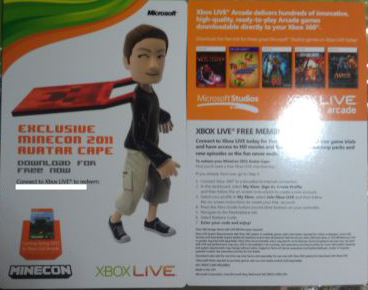 XBOX LIVE Avatar Gear is giving away 2 EXCLUSIVE Minecraft Codes! Pig Head and Cow Head that were from the McDonald’s & Dr. Pepper Text Promo. Did you miss it? Here is your chance to WIN THEM!! LIKE and SHARE this pic to your Facebook wall to be entered to win. MUST DO BOTH!! Winner will be choosen 8-19-12 Good Luck! Please comment below and click the Like and Tweet Button below as well. It seems that there is a new Exclusive XBOX Avatar Item everyone will want.